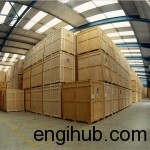 In engineering plant, storage is the place where machines and spare parts are stored. Actually, a stationary air compressor is not a machine to keep in store. If the foundation is incomplete, it requires being storage for some time. In this situation, you have to take due care up to commissioning of the compressor. The unpainted Compressor surfaces are subjected to Rust and Corrosion. However, every Compressor going out of the factory is always processed with Rust Preventive Oil. This Rust Preventive Oil will work better up to one month and if your requirement is more than this period then you should have to take extra preventive steps. The Rate of Corrosion varies with Climatic Conditions. Variance in Climatic Condition makes it impossible to state the length of time. In very humid climate rust formation is fast and in a dry climate, it is slow. Below information will help you in proper storage of the compressor. 01) Open top cover from the crankcase and clean Crankcase from inside with help of the cloth. Never use cotton waste for cleaning purpose. 02) Fill H.P.Rustop-286 or any other Anti-Corrosive Oil in Crankcase and rotate Compressor belt wheel for several times. This will ensure the circulation of Anti-Corrosive Oil to all moving parts, Cross-Slide and Guide. 03) Clean low pressure and high-pressure cylinders and spray sufficient quantity of H.P.Rustop-286 and rotate Air Compressor several revolutions. 04) Place Silica Gel bags in valve ports and refit valve covers if the Air Compressor is a Non-Lubricated type. Nowadays Teflon spray is used to prevent the valve from corrosion. Don’t remove this material. 05) Drain water from Cylinder Jackets, Inter-Cooler and After-Cooler and thoroughly flush with clean water with H.P. Radiator Cleaner. Refilled the system with 10:1 mixture of Water and H.P. Radiator Cleaner and keep it for 4 to 5 days. Remove it after the said period. In cold condition, where Water Freezing may occur, in that case, drain the mixture immediately. 06) Drain H.P.Rustop-286 or any other Anti-Corrosive Oil from Frame and Force Feed Lubricator. 07) If V-Belts are fitted, remove it completely and store it in a separate place. 08) Apply sufficient quantity of preservative grease to the piston rod also. 09) Plug and seal all openings thoroughly, so the Moist-Air and Dirt do not enter any part of the compressor. 10) Storage Air Compressor in a dry place under shade or in a separate room. So, I hope the above guidelines for storage will help you to storage your compressor very safely until you start utilizing it.